Since the invention of the planing hull, naval architects have battled to reduce the effects of slamming while travelling across lumpy seas at speed. Soni Levi’s deep-vee hull softened the worst impacts over half a century ago. But other than the suspension seat and occasional experiments with active trim control, the basic principles have barely changed since. Now Australian company Nauti-Craft has taken a radical approach to the problem with the launch of its 8m prototype catamaran 2Play. Rather than designing a hull that tries to bash its way through the water, Nauti-Craft sought to use and control the energy of the waves by developing a system known as DACS (Deck Attitude Control System), an interconnected hydraulic suspension system that isolates the hulls from the main superstructure. In a nutshell the boat rides on two catamaran-style hulls. Much like the tyres on a car, the shape and design of these provide the first response to the sea state. But DACS also has a second response in the form of suspension between the hulls and the boat’s superstructure. The beauty of this system is that it is enhanced both passively and actively. 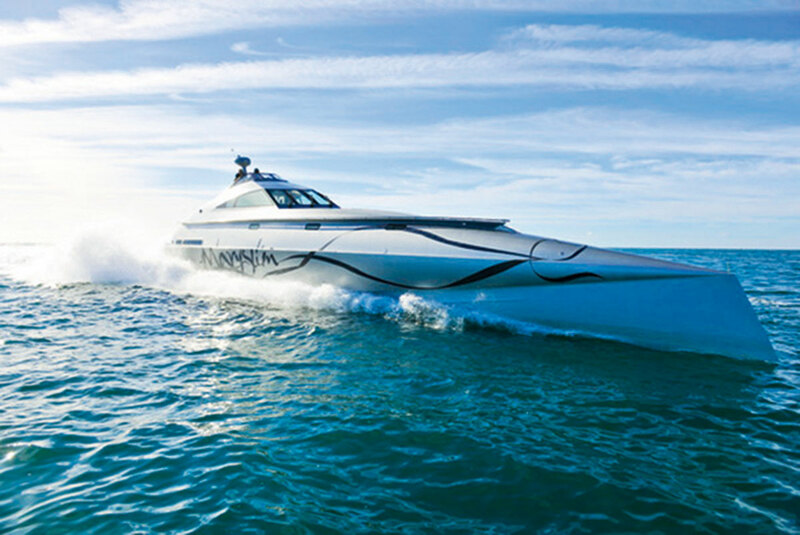 As a fascinating video on the Nauti-Craft website shows, 2Play rides over the water much like a 4×4 driven over rough terrain at speed – it’s no surprise after watching the video to learn that the vessel’s technology was adapted from the world of rally cars. Watch the video carefully and you can see the hulls moving up and over the waves while the main deck of the boat stays remarkably flat and still. We even had a brief chance to experience this for ourselves because Nauti-Craft shipped 2Play from Australia to Southampton for the Seaworks commercial craft show this summer. 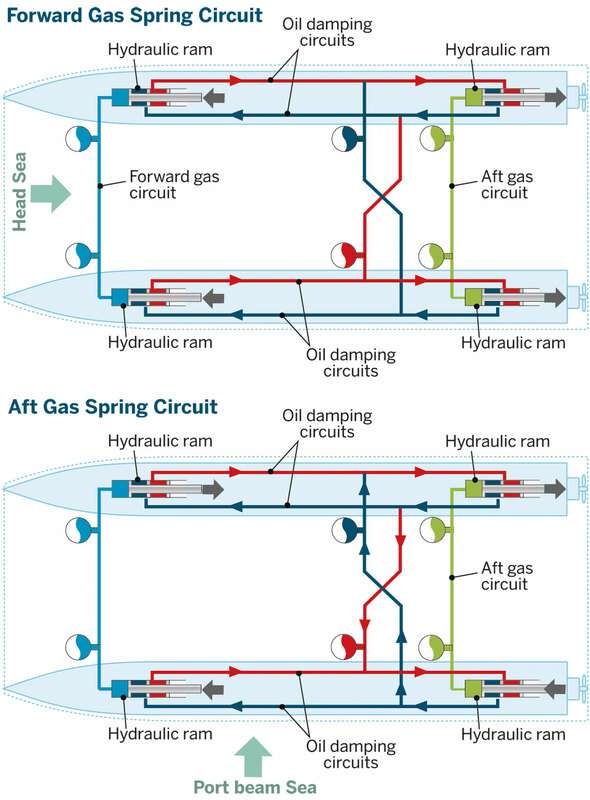 Each hull has two gas-sprung, oil-damped rams at the bow and stern. The two suspension circuits are linked fore and aft as well as across the beam. The gas springs consist of four spherical cylinders (anyone who had the air-sprung Citroëns of old will be familiar with these) half-filled with helium and pressurised to 60 bar. The oil-damping circuit which links all the rams also uses pressurised cylinders; in this case half-helium, half-hydraulic fluid pressurised to 30 bar. The two suspension circuits can act independently of each other or together in varying degrees. In a head sea, the fore and aft suspension circuits in each hull act passively – in other words, they function without being controlled by any external power source. So, as the head sea lifts the bow of each hull, it compresses the forward suspension rams, forcing hydraulic fluid from the bottom of these (oil-damping) rams through hydraulic hosing into the bottom of the stern rams. At the same time hydraulic fluid in the tops of the rear rams is forced through hydraulic hosing into the tops of the forward rams. What this means is that the stern section of the hulls is pushed down as the hulls rise at the bow, allowing the main deck to stay relatively level. This reciprocating push-pull effect is then reversed as the wave travels towards the stern of the boat, again keeping the main deck level. The fluid transfer is controlled by damper valves in each hydraulic hose. When these are subject to a rapid increase in pressure they open wider to produce a faster reaction. In a mild sea state, the openings stay much tighter with a commensurately softer reaction. This prevents any over- or under-reaction and stops the rams from bottoming out. 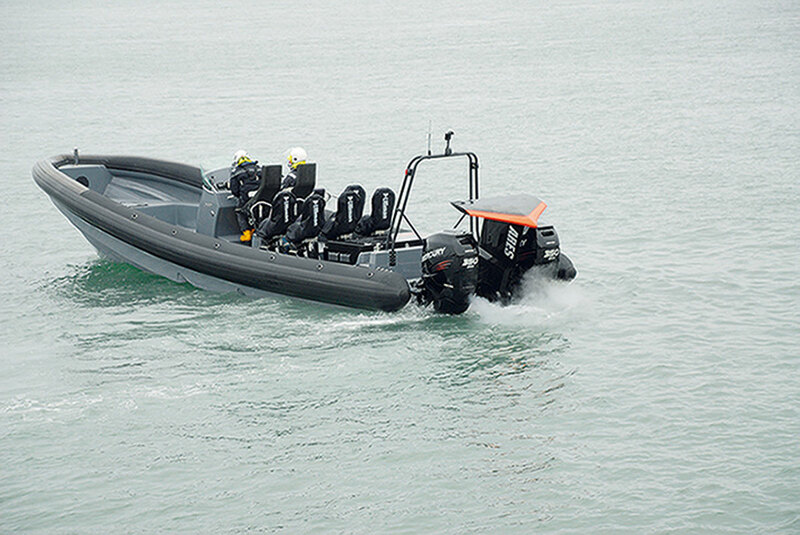 Nauti-Craft put this to the test for us with a 30-knot crash-stop on Southampton Water. The moment the power came off, we felt the nose start to dip but as it did so the rams compressed, absorbing the energy and transferring it aft, so that the deck stayed remarkably flat. Unlike a normal catamaran with a fixed deck that links the hulls, 2Play’s hulls can act independently of each other. In a beam sea, the suspension has the same push-pull effect as in a head sea, but operating laterally. As the wave hits the port side and lifts the left hull up, it compresses both the fore and aft suspension rams on the port side and simultaneously extends the starboard side rams to keep the cockpit level. In this case the port hull rises to accommodate the passing wave while the starboard hull drops, then the whole process reverses again as the wave reaches the starboard hull. However, for a beam sea the system is actively enhanced with a generator-driven hydraulic pump – the distance between the two hulls is shorter than the fore and aft length, so the system requires a faster response time. A central control panel enables the user to fine-tune this response time to the precise motion of the waves. And as we discovered, it can be used to demonstrate rapid roll or pitch at the press of a button. At the moment, Nauti-Craft is targeting its technology at European wind farms, an area where a stable deck platform is essential. In fact, its first wind farm prototype was an even more radical jet-driven four-hulled craft called 4Play. With two forward hulls and two aft ones, all able to move independently like the wheels of a car, this 2.3 tonne 40-knot boat had even better seakeeping than 2Play. However, the marine power industry preferred a more robust, more conventional catamaran design. Watch the video of 4Play online and you can’t help but dream about its potential as a racer. 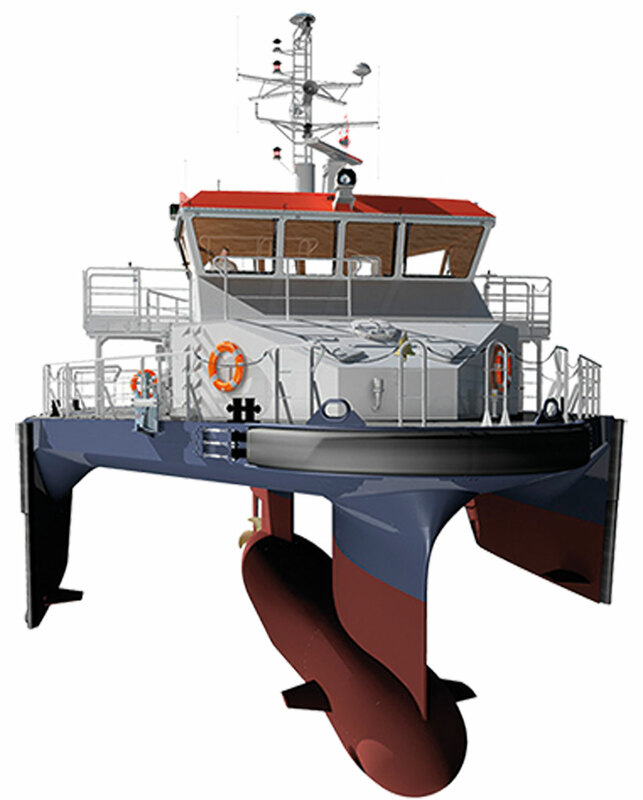 The commercial incarnation of 2Play will be 24m long and able to provide a stable deck in the most challenging of seas. However, there are already rumours of a 14m leisure dayboat in development. Judging from our spin in Southampton, we can see why. Other ways to beat slamming. Swath hulls: This novel multihull design works by minimising a hull’s cross-section at the waterline where wave energy is concentrated – reducing the hull volume here will maximise the vessel’s stability even in big seas. The bulk of the displacement that is required to keep the vessel afloat is housed in a pod beneath the waterline that also contains the propulsion system, where it is less affected by the wave action. Wave-piercing hulls: These have a very fine bow with reduced buoyancy forward, so the front section of the hull pierces waves rather than rides over them, producing a smoother ride than a traditional planing hull. Because long thin hulls are needed, many wave-piercing boats are multihulls to maximise lateral stability as well as accommodation space. Mary Slim (pictured above) is one of the rare exceptions. Sea Blade: Ice Marine of Southampton took a different approach to the problem by adding a large submerged blade to the transom of a conventional RIB. By rapidly altering the angle of the blade with the aid of a computer controlled sensor, it can produce lift or downforce quickly enough to counter the effect of passing waves. A bit like a huge and very fast-acting automatic trim tab, it lifts the stern and lowers the bow to reduce each impact. First published in Motor Boat & Yachting, issue November 2014.